When I first started blogging, I had already been to many of the restaurants in town, but had not taken pictures nor written about them. It was a bit of a drag to go back to each and every one for the purposes of being complete. 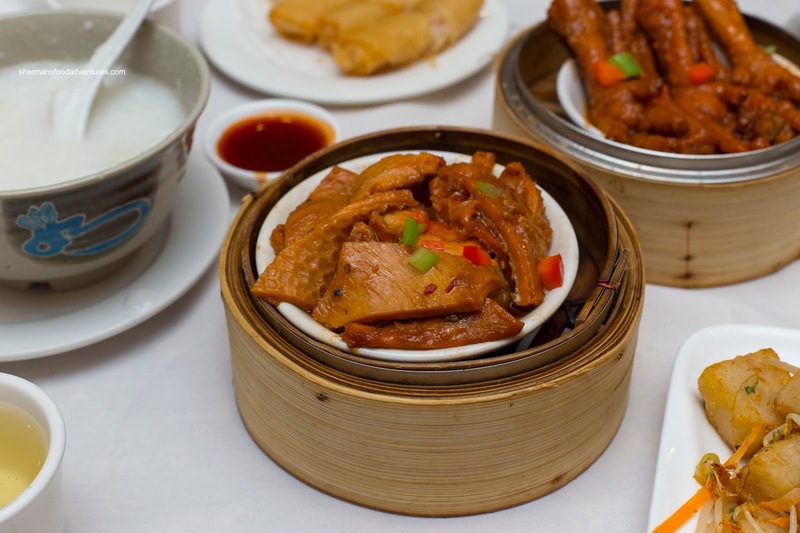 However, some slipped through the cracks since we find newer restaurants opening up frequently. 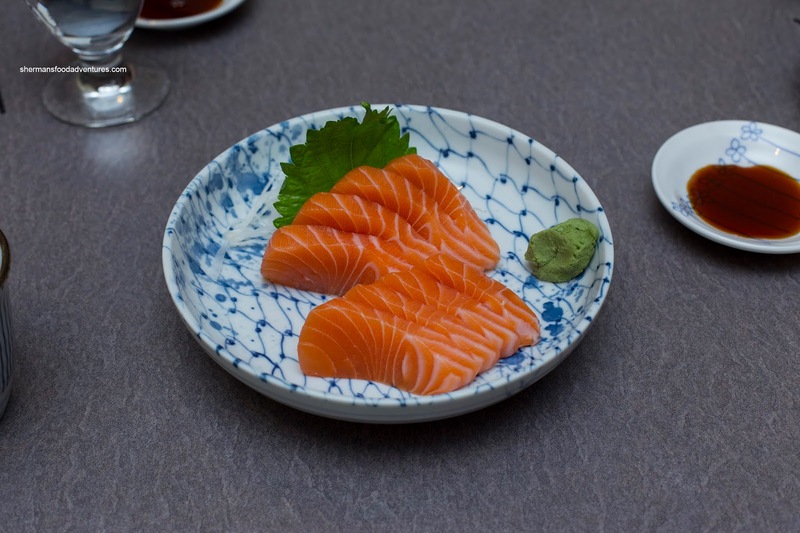 Therefore, places such as The Eatery and Isami Sushi have been lost in the shuffle. 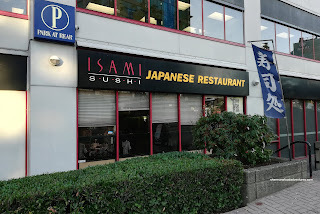 Thanks to a comment from a reader, he reminded me of Isami Sushi and I made it a point to go eat there. We ended up meeting with Popper and Popette where we had the plan to grab some Soft Peaks afterwards. With the kids attacking the Salmon Sashimi shortly after I took a picture of it, Viv and I were only able to wrangle one piece from their ravenous appetites. Considering the price ($11.00) and quality, this was a pretty good value. For a non-value type of Japanese restaurant (ie. Sushi Town, Sushi Garden, Sushi California), the sashimi here was inexpensive, well-portioned and buttery. We were all giggling at the typo on the menu that read "shopped scallop cone" rather than Chopped Scallop Cone. My son actually wanted one, so we ordered it. As evidenced in the picture, they didn't skimp on the baby scallops as the thing was an almost perfect 50:50 ratio of rice and scallops. They were lightly dressed, buttery and sweet. He found the sushi rice to be on the softer side, but still chewy and mildly seasoned. Trying to change it up a bit, I decided to try out their Unagi Battera. Neatly constructed, but a little loose, each piece fell apart as we picked them up. There is a fine line between being too densely packed and too loosely constructed, so in general, it was still fine. As such, the texture of the rice was softer and fluffier, but still with some chewiness. 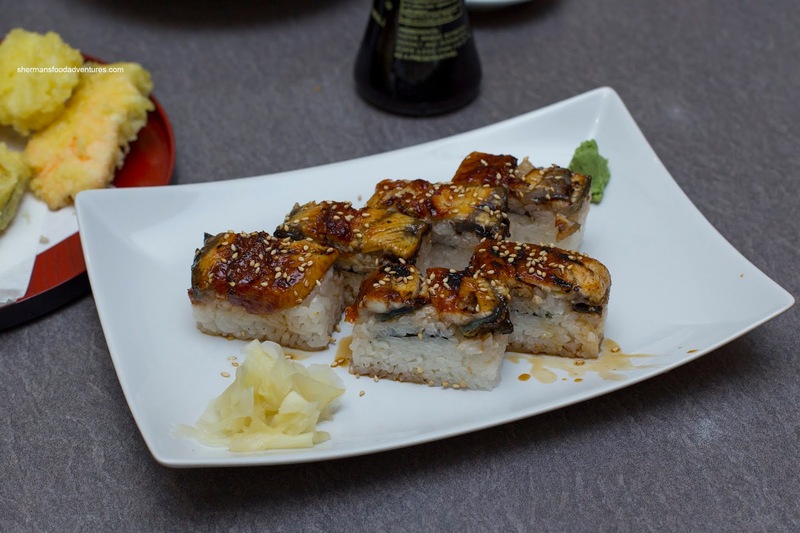 On top, there was an ample layer of buttery unagi that wasn't over-sauced. 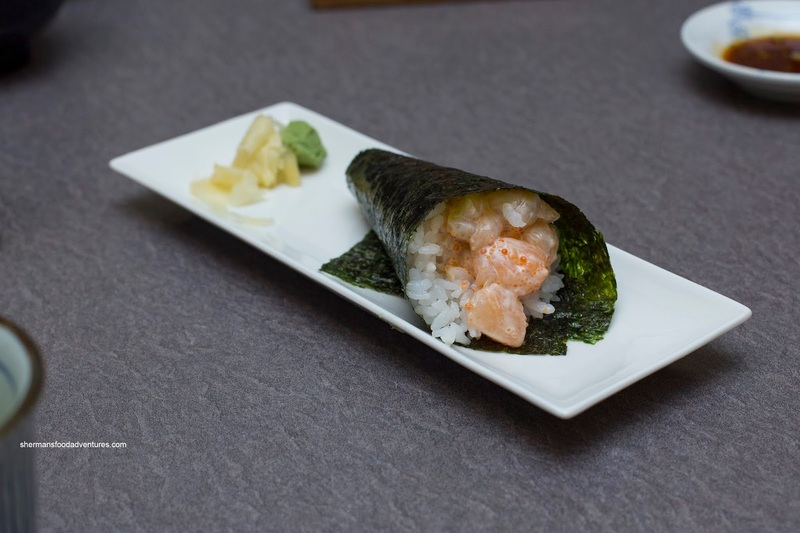 We weren't interested in getting any specialty rolls, but wanted something bigger than the traditional ones. 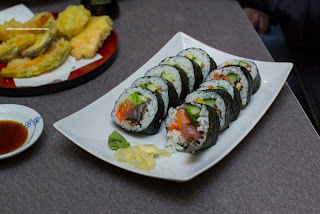 Hence, the compromise was in the Special Maki consisting of tuna, salmon, salmon skin, cucumber, avocado and flying fish roll. This was 10 pieces large and stuffed with plenty of filling. I though the roll was pretty standard (besides being big) and ate quite well with the right textures. 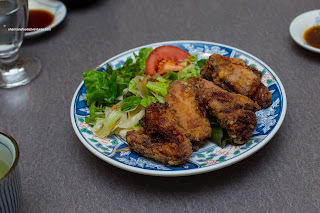 Originally, I was going to give the Chicken Karaage a go, but it appeared we had enough food already. Fate would have it, Popper ordered it and offered me a piece! Exactly what I had on my mind... Beyond the crispy rendered skin, the meat was succulent and had a certain umaminess to it. We couldn't put our finger on that particular flavour, but it was appealing. For some reason, it was served with a salad (not that we were complaining though). 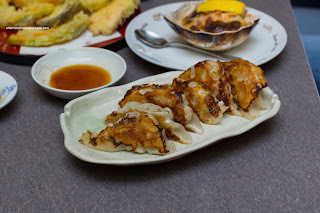 Usually, my daughter can easily down an order of Gyoza all-by-herself in addition to eating other items. However, she only ate half of one this time around. For me, it sort of made sense as the filling was rather mushy. There was a pleasant hit of ginger though and the dumpling skin was delicate while seared quite well. 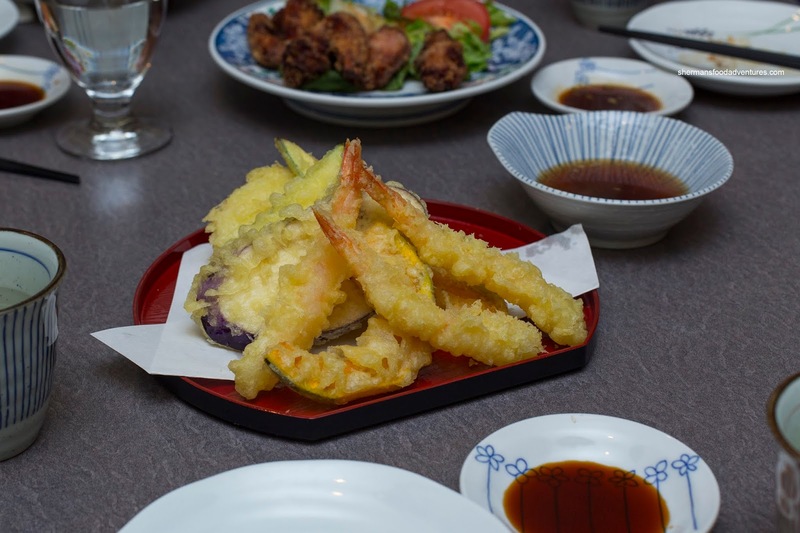 As always, we got the Assorted Tempura, but this was a bit different where they added 2 pieces of fish with the usual ebi and veggies. I found the batter to be pretty thin, especially on the veggies. So much so, you can actually see the veggie underneath as seen in the picture. Despite the minimal batter, everything was still crispy. Arriving on a cast iron plate, the Beef Yakisoba was not sizzling. Why serve it on such a plate if you don't do it right? Anyways, this was pretty average in my books. I found the noodles almost not cooked enough being not overly hot and somewhat too chewy. They were also pretty greasy which made for a not-so-appealing mouth feel. The dish ate dry as there wasn't enough moisture. Lastly, there was a lack of flavour which might've had something to do with the dry noodles as well. Trying something different, we had the BBQ Mixed Seafood. 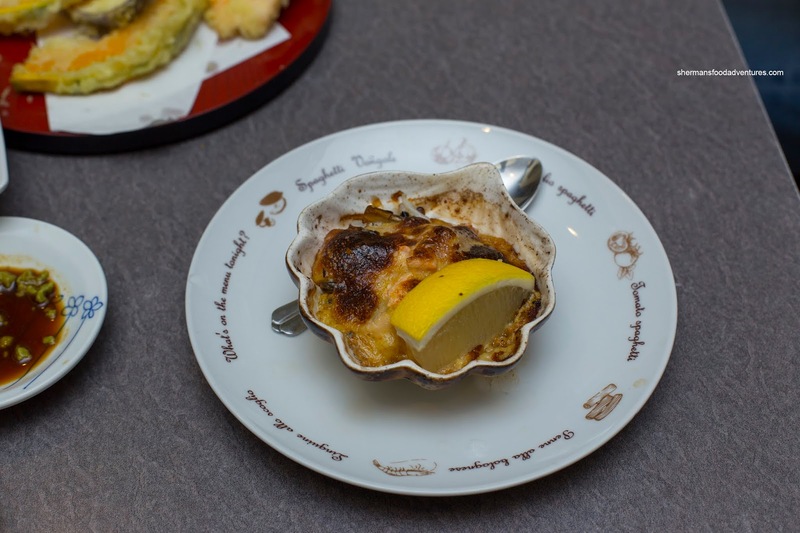 Okay, if the picture looks more light a seafood motoyaki, then you are right. What they did was BBQ the seafood and then chopped it up and baked it with a creamy sauce. We weren't really fond of this either as the seafood was overdone and not smoky (despite the BBQ). Lastly, we had to add a Mini-Chirashi Don since my son was not satisfied with the amount of food we ordered. Well, this was a fabulous deal at $12.00. 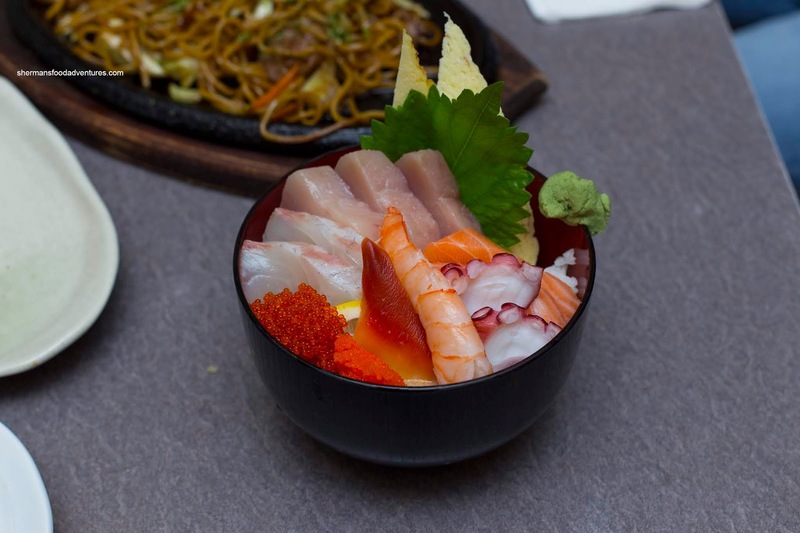 This was topped with plenty of sashimi which was fresh and visually appealing. It ate well too with chewy sushi rice underneath. So overall, our visit to Isami Sushi yielded generally decent food at very reasonable prices. Not sure about the cleaniness of the place though, they might want to look into that. If one was looking at the front of Ryan's Chinese Restaurant, it would be very confusing to see Wah Lun Chinese Restaurant staring back at them. Yes, that is the old name of the place and in fact, they have gotten rid of the big sign that is adjacent to their parking lot. Maybe they just haven't had time to change it perhaps? Well, it has been almost a year since I've been noticing "Ryan's" atop the receipts, so I'm not sure why they keep the old signage. Whatever the case, we've been stopping by the place after swimming at nearby Eileen Dailly for the past year. Finally, I decided to suggest it to the guys after Sunday Morning hockey. A testament to the good-sized portions, we didn't finish all that we ordered. 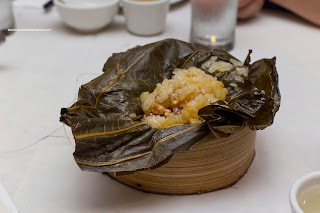 It probably had to with the amount of carbs as well including the Lo Mei Gai (Sticky Rice in lotus leaves). These were so large that they barely fit into the steamer. In addition, the layer of lotus leaves was rather thin, meaning that there was a considerable amount of soft sticky rice. There was a good ratio of ground pork and shiitake mushrooms as well as the requisite cured sausage. I thought there was just enough balanced seasoning. Continuing with the carbs, we had the XO Stir-Fried Daikon Pudding Cake. This was on point with medium-sized cubes of semi-soft daikon cake that was appealingly crispy on the outside. They were well-seasoned on their own with cured sausage and dried shrimp, but the light toss of XO sauce added a spicy brininess. 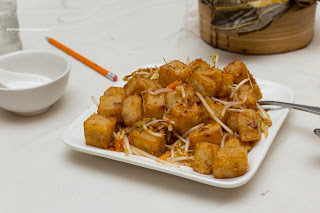 We found the dish to be not very greasy and the bean sprouts were perfect, being cooked but still crunchy. Yep, the carb fest continued with both the Shrimp Rice Noodle Roll and the Beef Rice Noodle Roll. 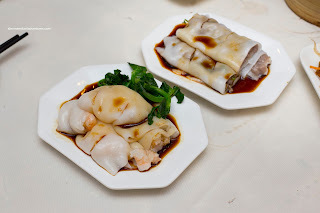 Although the shrimp noodle roll was haphazardly constructed, it featured the same good qualities as the beef noodle roll. Soft and almost buttery, the rice noodle retained an elasticity. Inside, the filling featured smaller shrimp, but they were texturally fine having a light rebound while completely seasoned. On the firmer side, the beef was still soft with a bounce and had just enough greens. 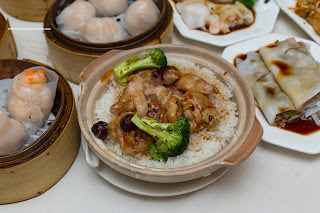 Staying with the rice theme, we carbed-up even more ordering the Chicken & Sausage Hot Pot Rice. Although the amount of tender chicken was adequate, they could've added a few more pieces. I found the rice to be fairly wet underneath the chicken, but decently chewy and dry everywhere else. This was only an okay dish compared to the rest. 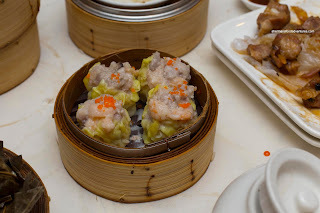 Finally onto some dumplings, we had the Ha Gau (Shrimp Dumplings) and Siu Mai (Pork & Shrimp Dumplings). 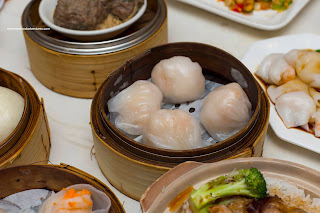 Sporting a medium-thick dumpling skin, the impressively large ha gau were relatively good. The skin featured a certain level of elasticity, yet at the same time, it was a tad oversteamed. Inside, the shrimp filling was buttery, moist and subsequently loose. There was a subtle snap texture, but overall, it was on the softer side. It was mildly seasoned where I could taste the natural essence of the shrimp that was complimented by sesame oil. 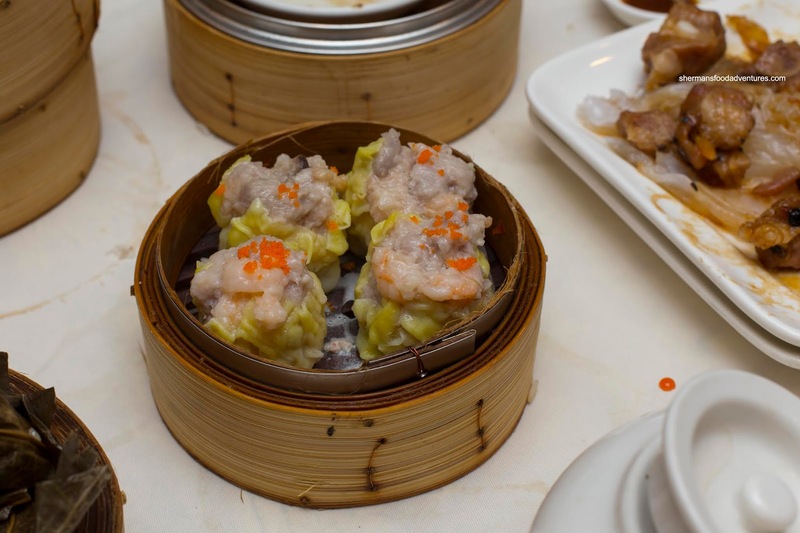 We weren't as enthused about the siu mai as the chunks of pork were too meaty where it lacked the classic bounce texture. There was plenty of shrimp though and that provided some of the rebound missing from the pork. It did taste good with a sweetness balanced by equal saltiness. Being on the firmer side, the Beef Meatballs were rather robust in texture. It did exhibit the classic bounce, yet at the same time, it was too dense. We would've preferred there to be more starch and baking soda to lighten up the meat where it would be more buttery and airy. With that being said, it was still fine with only a bit of cilantro while the seasoning was just enough (that doesn't usually matter since it is served with a side of Worcestershire sauce). Continuing on the theme of large portions, the Deep Fried Taro Dumplings were massive. The main reason for this was the thick layer of soft mashed taro. On the other hand, there was an equal amount of moist ground pork filling that was described as being in a Portuguese sauce, but really, it was more curry (needed more coconut milk). Whatever the case, it was good with a crispy exterior which was only mildly greasy. 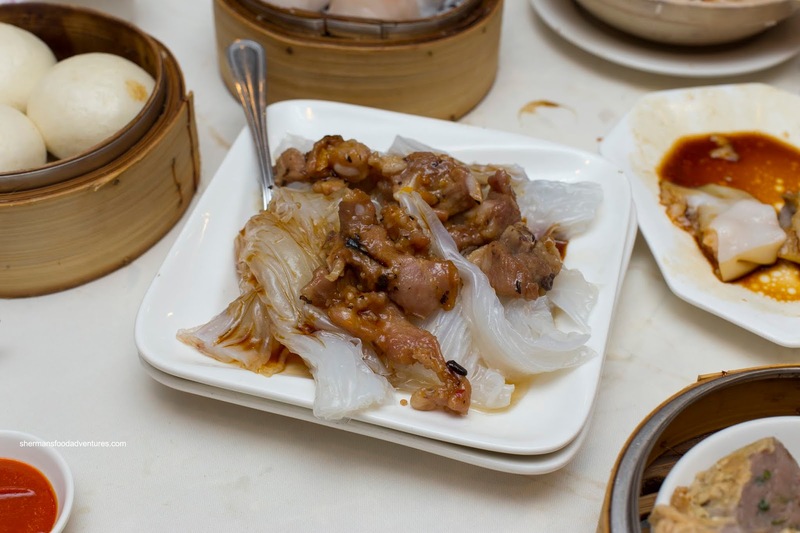 Although the Steamed Spareribs with Crystal Noodles appeared to be another carb-heavy item, it really wasn't. Made from mung beans, the noodles are actually pretty low in carbs, but that didn't prevent them from being filling though. The noodles were perfectly chewy and not oversteamed. As for the spareribs, they were a bit overtenderized where there was no longer any meatiness nor rebound texture. We could've used more soy or more residual juices from the spareribs as the dish ate bland. 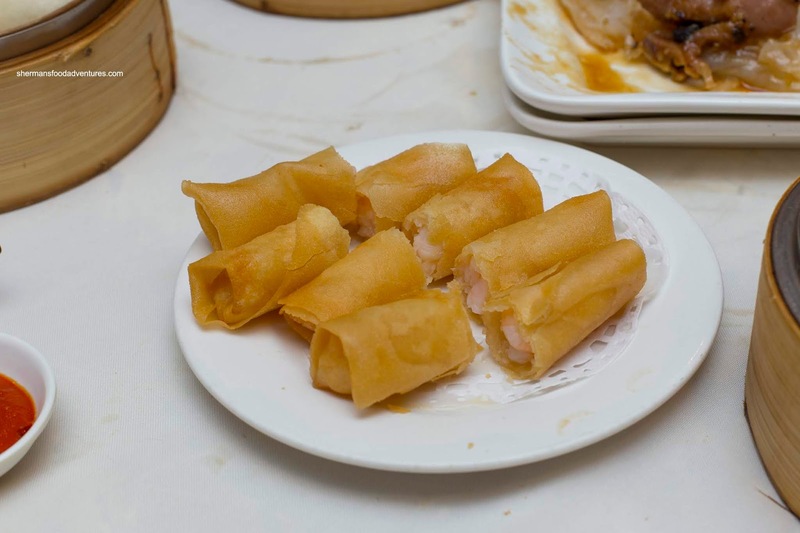 Our last savoury item was the Shrimp with Garlic Spring Rolls. These were very good being served hot and crunchy. They were easy on the grease while the filling was full of buttery shrimp that had a moist snap. The garlic really came through as well as the ample amount of seasoning. I appreciate the side of sweet & sour sauce as I believe it goes way better than Worcestershire when it is mainly shrimp rather than pork. Off to some offal, I had to get my usual favourite being the Steamed Beef Tripe (Honeycomb type). This featured uniformly-sized slices of tripe which were fairly well-rinsed. Hence, it wasn't overly gamy, but did retain some "flavour". The seasoning was pretty spot on giving hits of spice, sweetness and saltiness. Texturally, the tripe was buttery tender with a light chewiness. 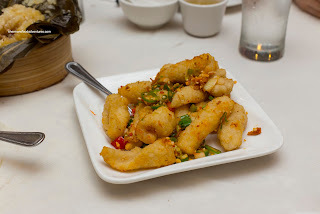 With a similar flavour profile, the Phoenix Talons (Steamed Chicken Feet) were good as well. 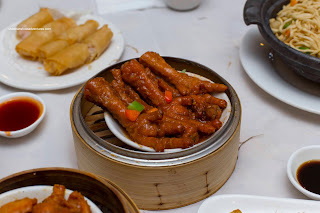 Kept as a whole rather than being cut up into 2, the chicken feet sported an appealing hue. The skin was soft with a chew while underneath, the cartilage and fat was plump and cooked down (but not melted). These were pretty textbook. 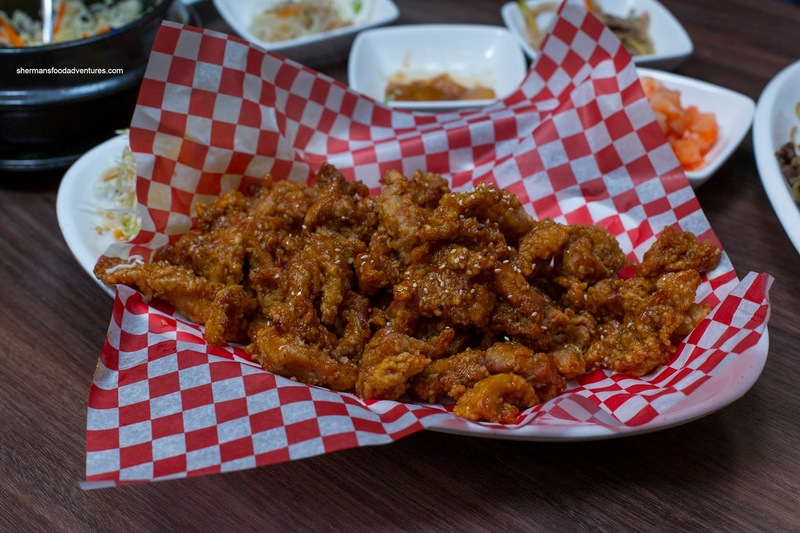 We don't usually go for the Deep Fried Squid, but decided to for some reason. It was a good choice though as each piece was on point. 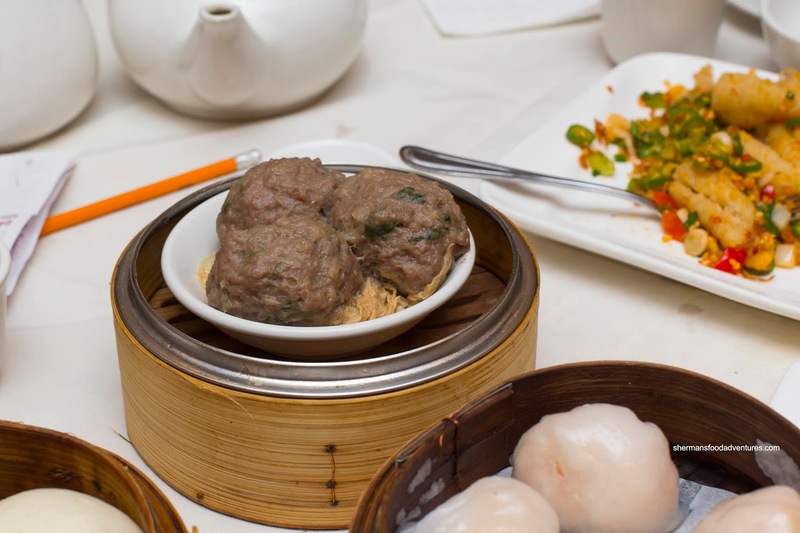 The desired texture was achieved being slightly chewy, somewhat meaty and tender throughout. Lightly battered, the squid was crispy on the outside. 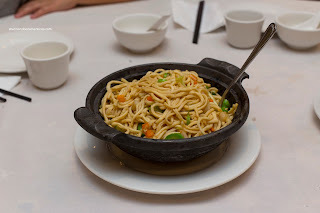 Everything was complete with a wok-toss of garlic, peppers and salt. I particularly enjoyed how this dish was not greasy despite the cooking process. Something that was rather "meh" was the Seafood Yee Mein Hot Pot. It was as if they merely tossed the par-boiled noodles with a bit of seafood and veggies and dumped into a hot pot. It wasn't sizzling nor were the noodles tender. Rather, they were dry and chewy as well as being extremely bland. 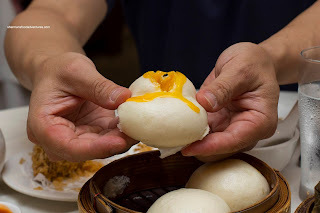 For dessert, we had the Sweet Salted Egg Yolk Buns. As you can see in the picture, the custard inside was pretty watery. Hence, we couldn't really do a good picture without it splattering all over the place. it did taste good with a muted sweetness and the umaminess of salted egg yolk. 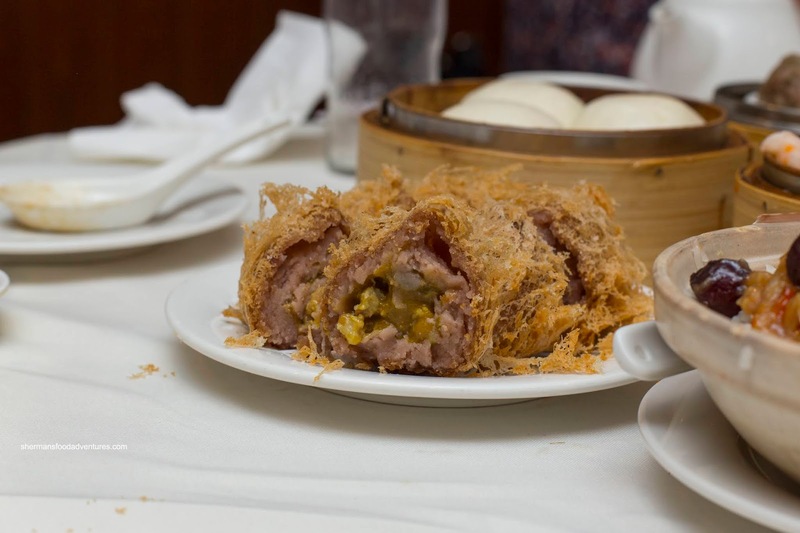 The bun itself was fairly light and fluffy other than the chewy exterior. In the end, Ryan's Restaurant satisfied what a Dim Sum meal should be about. It wasn't outstanding, but given its location, there is not much to complain about when it comes to the food. Solid neighbourhood spot. Last hockey season, we ended up hitting up the ol' favourites for late night eats rather than searching for new spots. Blame it partly on convenience and mostly on laziness. Sometimes, I just want to eat and especially after ice hockey, I'm not in the mood to be a "food blogger". Futhermore, it has only been mainly Lionel Hutz and Milhouse joining me for eats, which means keeping it local (ie. Burnaby/East Van only). However, for this season, I've made it a personal goal to actually try new things. Yah, imagine that... So we headed over to Morak Korean Fusion which we've been trying to dine at for the last 2 years. 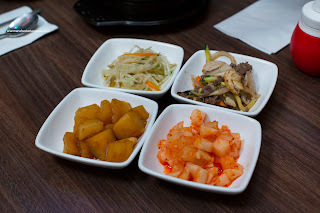 Of course, our meal started out with the included Banchan consisting of marinated bean sprouts, bulgogi and veggies, stewed potatoes and pickled spicy daikon. We were surprised to see that they didn't included the usual kimchi, but it was not a problem as Lionel Hutz doesn't prefer the stuff. Of the items we did get, the stewed potatoes were money being soft while not completely melting away. They were sweet while not overly so. I also enjoyed the daikon as it was crunchy, sweet and slightly spicy. 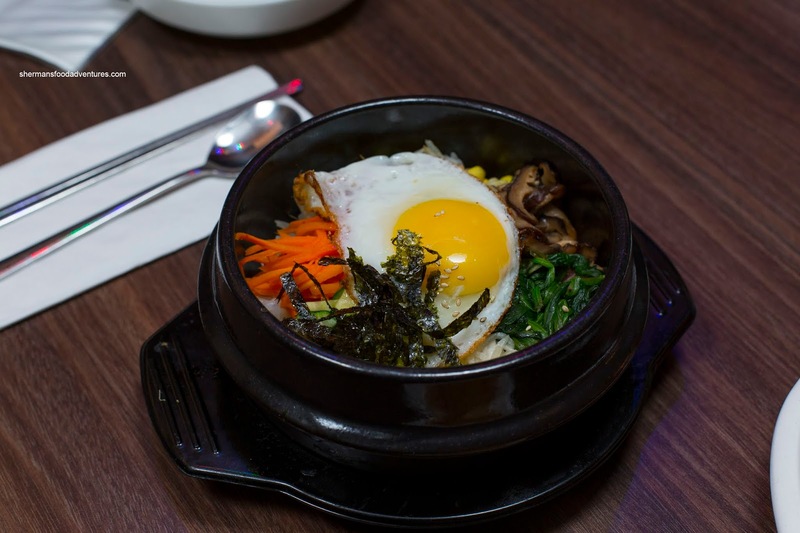 Onto our larger dishes, we began with the Dolset Bibimbap. It came sizzling in a hot stone bowl with neatly prepared and properly textured ingredients. I found the rice to be a little on the softer side and it didn't really crust up enough for my liking. However, the whole thing still ate well. I would've preferred to see a raw egg rather than a fried egg on top. 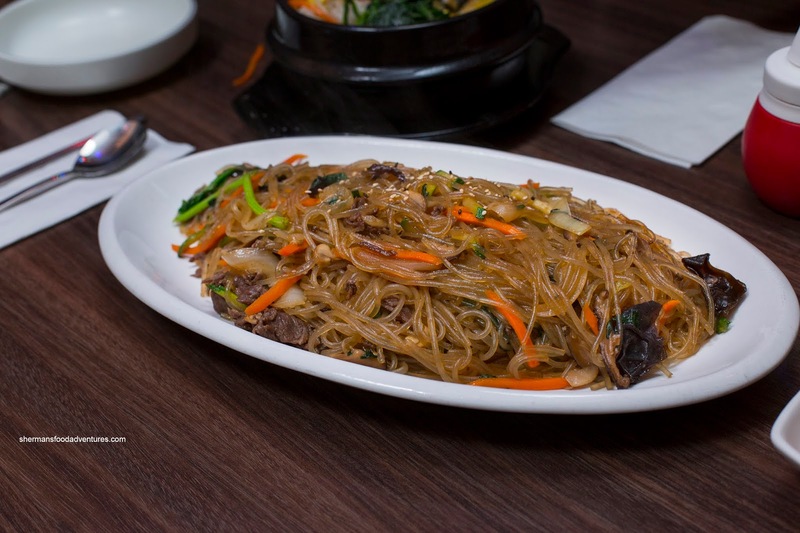 Going for another typical dish, we got the Japchae which was at its usual high cost of $22.00. I know it is common to see it in the $16+ range, but this was pretty expensive for noodles. It was done right though with slippery chewy noodles that weren't greasy. In fact, they were able to keep them moist without the oil - perfect in my opinion. 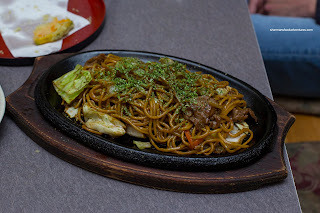 There was enough ingredients, including tender well-seasoned beef, to keep each bite varied with texture. Another positive was the usage of sugar as it was done with restraint. A well-executed japchae, but an expensive one at that. 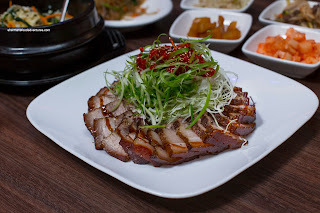 Talking about pricey, we also had the Bossam at $25.00. 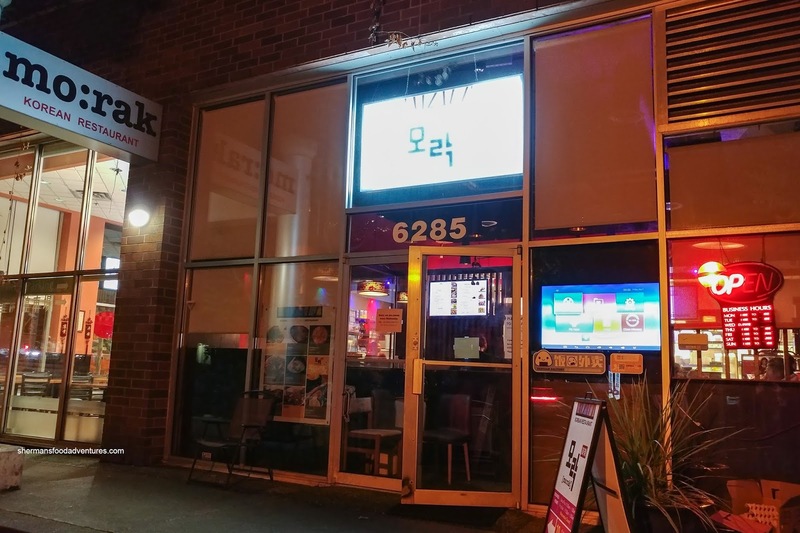 Again, not totally surprising because most other Korean restaurants charge that much and more. Besides, there was a good amount of tender, gelatinized pork belly on the plate. We enjoyed how it was flavourful while the fat was not flabby. It had a roasted quality to it despite not being baked. Lastly, we had the Dakgangjeong (Sweet Crispy Chicken) which was also priced at $25.00. Normally, that is not a big deal since the portion size is massive. This one was medium-sized and yah, I still don't understand the pricing (that goes for most Korean restaurants). However, the level of execution was good. Each piece of chicken was crispy and full of garlic essence and flavour. I also liked how they didn't overdress the chicken so that it was only a bit sweet. Therefore, I didn't need a bowl of rice to down it. Many places drown their chicken in too much sauce. So I'm sure you get the gist of this post - good but expensive. Not unique to Morak, but worth noting as you can eat anywhere for these prices. Brownies Chicken - now there is a name that hasn't been talked about in some time. 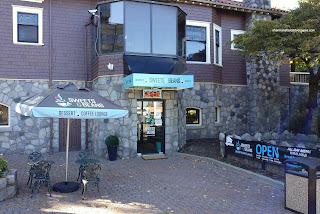 There used to be several locations in the GVRD back in the day, but one-by-one they all closed down. It kinda mirrored what happened to Lee's Chicken and to a much smaller degree Juicy Chicken. 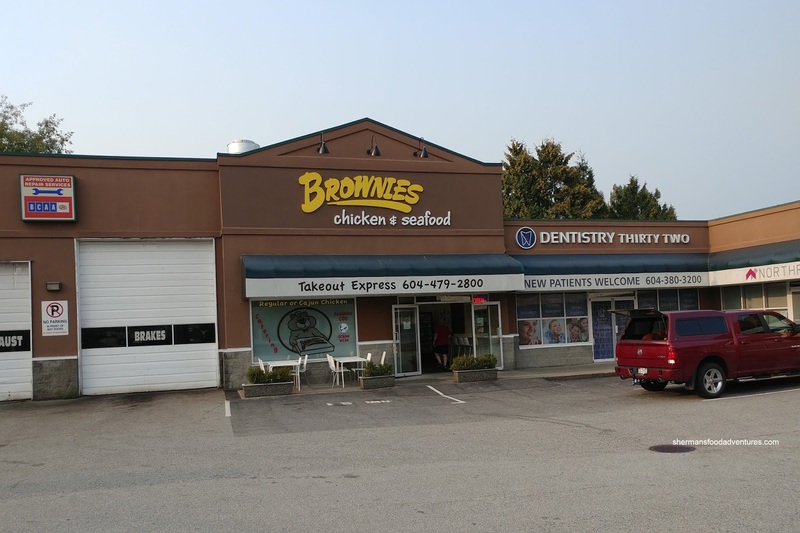 Heck, we even lost our only Popeye's in Coquitlam too (new one in PoCo soon!). So yes, we have been left with Church's and KFC as the dominant fried chicken spots in town. Of course we have LA Chicken and the newish Hi-5, but there is actually a Brownies Chicken out in Maple Ridge! 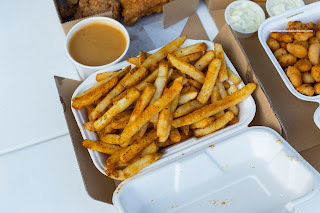 Run by an original franchise owner, they have updated the recipe while incorporating Rossdown chicken, Cavendish fries and Oceanwise fish onto the menu. 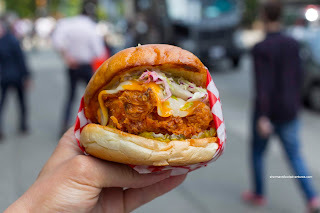 Amy, Diana and I ventured out to the Ridge to see how Brownies stacks up to the rest of the fried chicken competition in the Lower Mainland. It was a given we would get the 6 Pack consisting of mixed chicken, medium fries and choice of medium salad or gravy (we chose the gravy). Although more pricey than the aforementioned places, there was more than enough food for the price. Large in size, the pieces of chicken sported rendered skin and a crunchy well-seasoned exterior batter. I found the breast meat dry, but the dark meat was tender and moist. 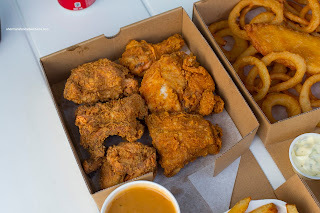 If I had to compare, the chicken was similar to Lee's which is a cross between KFC and Church's. On the side, the medium Fries was massive being crispy and spiked with Cajun spice. I found the gravy to be thick and mild in flavour. 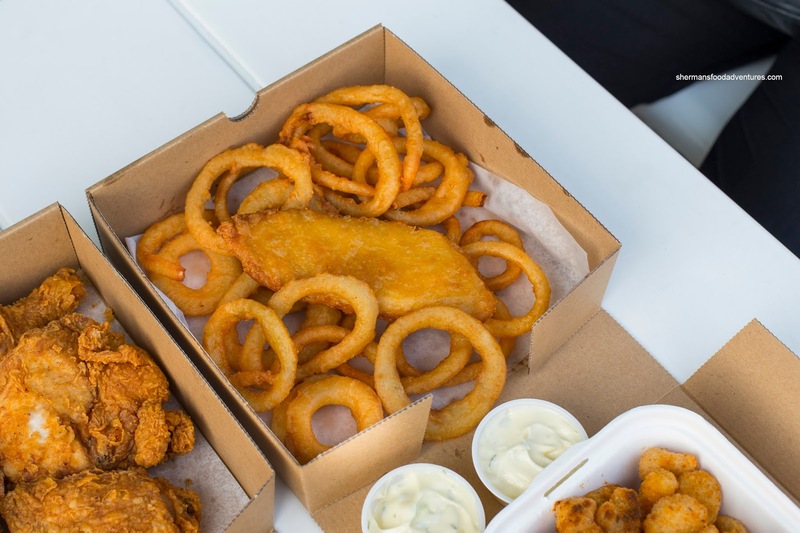 Just for research purposes, we also got the 1-Piece Cod & Onion Rings (we subbed it because we already had fries with the chicken). Compared to the chicken, this was rather pedestrian. To be fair, the fish was actually quite good being firm and flaky, but it wasn't anything memorable. That was definitely the case with the batter as it didn't differentiate itself from frozen fried fish. As for the onion rings, they were pretty good with a crunchy batter and tender onion. I personally enjoy the breaded type more, but this was still decent. 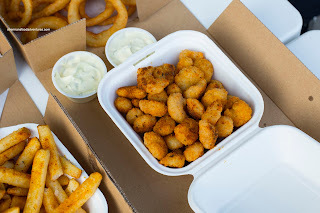 Lastly, we got an order of the Cajun Popcorn Shrimp which was pretty typical featuring a seasoned crunchy batter. The shrimp was buttery and had a cold-water snap. Again, not bad, but not something I would order again. If I had to sum up everything, I would use the White Spot analogy. Their burgers aren't the best in town, but it is a childhood memory and is comforting. Same could be said about Brownies. All aboard the Bingsoo train!!! 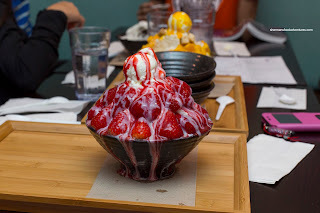 Yes, that is right, yet another Korean Bingsoo joint. 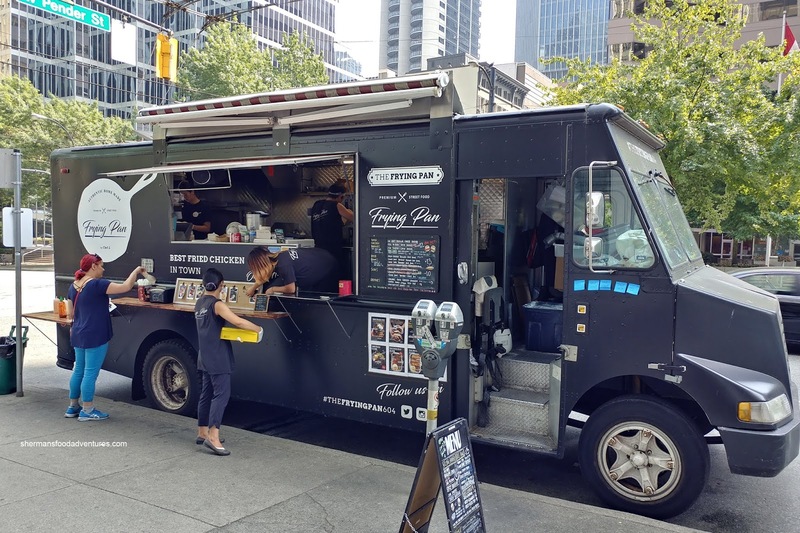 I know it is not unique to Vancouver, but it just seems to me that we get into these trends so quickly (like poke). 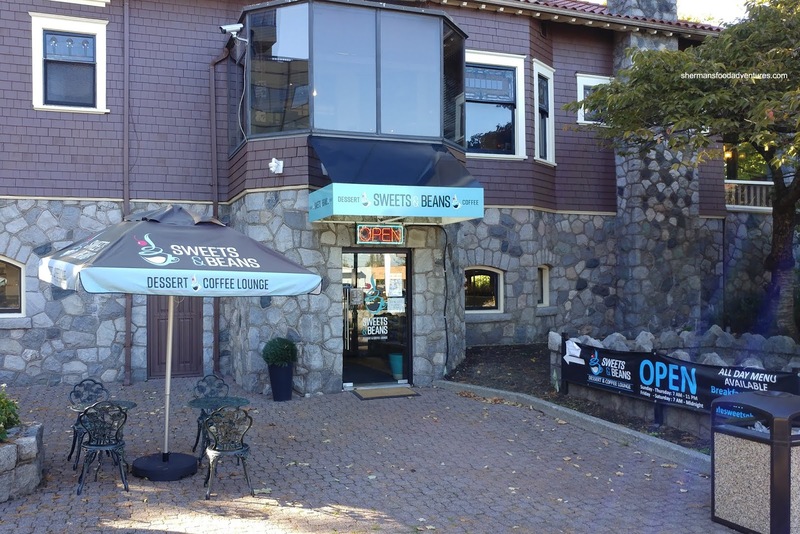 The latest to join the party is Sweets & Beans Cafe located right underneath Oyama Sushi on Kingsway in Burnaby. Now, unlike the rest of the Bingsoo spots in town, Sweets & Beans offers hot savoury food as well as brunch (and of course coffee too). Hence the "cafe" in the name. I originally checked it out in the Summer and once recently to try at least one of their non-sweet options. 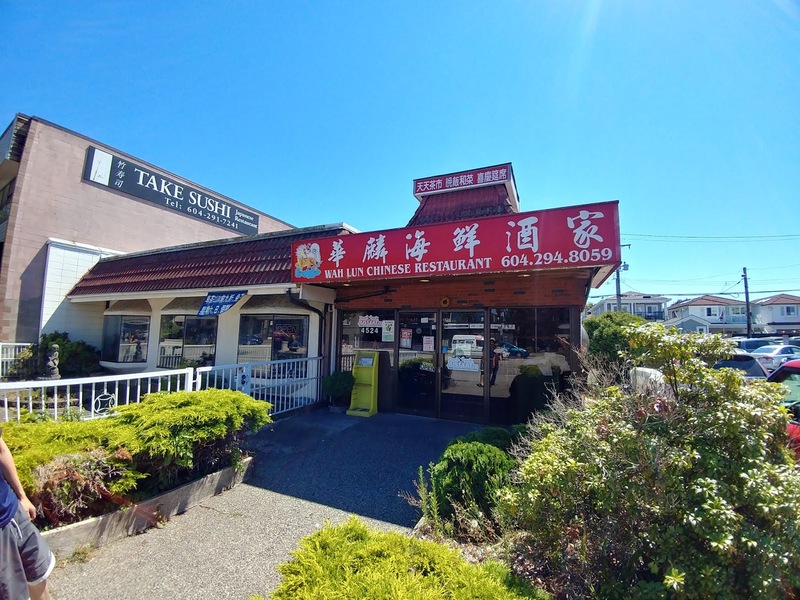 My first visit was after a meal just above at Oyama Sushi. We earmarked Sweets & Beans for dessert as we walked past it after parking our car. 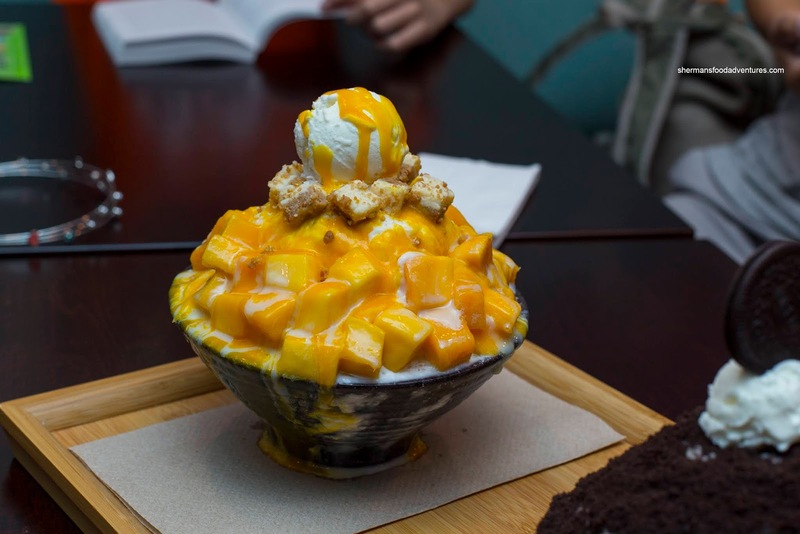 This was still in the Summer, so we got both the Mango and Strawberry Bingsoo (in large). Both were comparable to most of the other spots in town in terms of size and presentation. Due to the overload of condensed milk and toppings, the whole thing was a mess with things leaking off the side. I thought the mango was a touch less ripe, but it didn't matter to me since I like it a big tangy. There was plenty of it since it was layered in the middle and bottom as well. The strawberries were more ripe, hence it was sweeter. Mind you, it could've been due to the melted ice cream too... The snow itself was fluffy and light while not overly sweet. 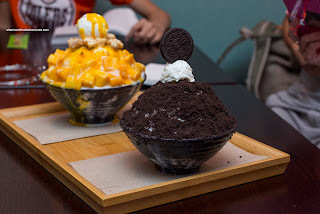 For the kiddies, they wanted the Oreo Bingsoo which wasn't exactly photogenic. Personally, I prefer the fruity bingsoo options over chocolate ones. However, if you love Oreo, I can see the appeal. This was loaded with Oreo cookie dust throughout. Hence, with the bingsoo acting as the "creme filling", it ate pretty much like an Oreo, but less sweet. 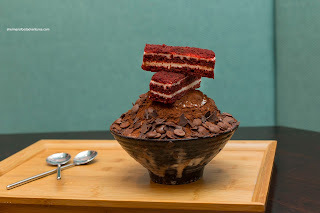 On my second visit, we went for another non-fruit bingsoo in the Red Velvet. This was loaded with firm and crunchy chocolate wafers (due to the cold bingsoo), dark chocolate shavings and cocoa powder. Yes, this was certainly chocolatey and surprisingly not overly sweet. The snow was super cold, so it was a bit dry to start. It did start to melt, where it became softer. On top, the 2 pieces of red velvet cake were a bit mealy, but moist and just sweet enough. 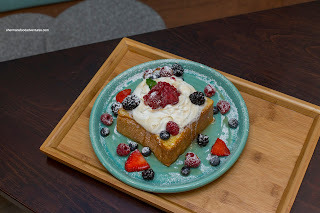 Onto one of their brunch items, we had the Maple French Toast with sweet berries, Maple syrup, raspberry sorbet, mint and fresh whipped cream. Surprisingly, this was not as sweet as it sounded. Some might want more syrup, but this was perfect in my opinion. The toast itself was lightly crispy on the outside while soft on the inside. I would've liked to see more egg soaked in as well as some sort of custard filling. But it was still good for what it was. 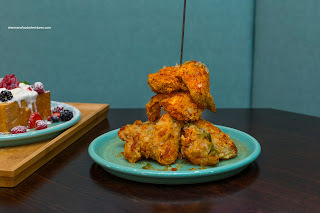 Lastly, we tried their Chicken Wing Tower soaked in "marine" sauce. I wasn't exactly sure what a marine sauce entailed, but it was a bit spicy and vinegary. There was a dusting of spice which was definitely impactful but the meat itself needed more salt. Although the exterior was crispy, I found the batter to be too dense while the skin wasn't fully rendered. The meat was juicy though. In general, Sweets & Beans is a worthy addition to the bingsoo scene and offers up something different in brunch as well as more coffee options. Well here is yet another, "I can't believe you haven't tried it" spots that I finally go around to. Remember, some of these food trucks only operate on limited schedules at locations that I simply cannot access since I do not work in Downtown. Hence, it is not as if I don't want to eat there, it is more like I have to find time to catch them when they are open. 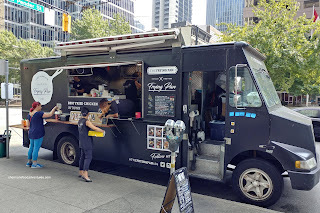 That wasn't a problem this time around since I was on vacay anyways, so I grabbed Viv and my daughter and headed down to 505 Burrard for The Frying Pan's signature item. Okay, the item to get here is their Spicy Chicken Sandwich. At first glance, it looked eerily similar to the one found at Down Low Chicken Shack, but I assure you, they are not the same. One is Nashville hot chicken and the other is a Korean fusion version. The one I tried at The Frying Pan was good in its own way. I found the large chicken breast to be super moist and juicy while the uniformly crunchy batter stayed adhered to the meat. It wasn't as spicy as it looked being more tangy and savoury. Nicely toasted, the bun kept everything inside without falling apart. We also decided to get the other sandwich in the Chicken Cheese and since it wasn't saucy, the crunch was even more pronounced. The ample melted cheese really came through in terms of texture and taste. 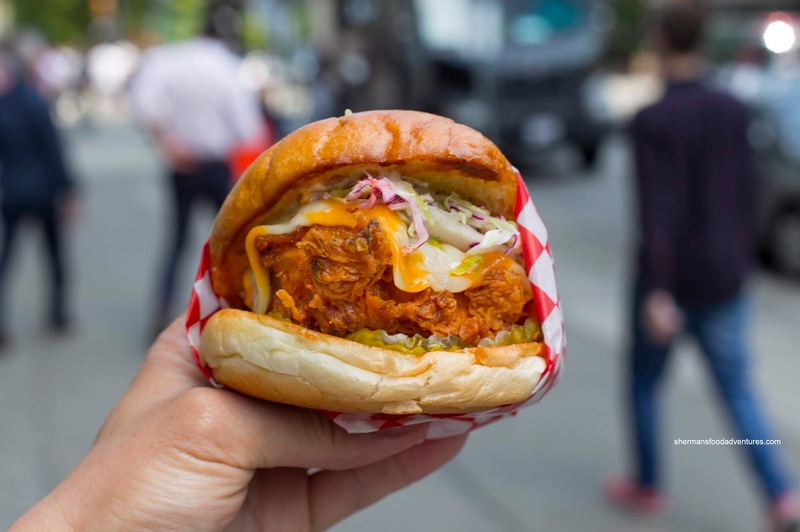 Just like the spicy sandwich, the crunchy pickles added a nice texture and tang. We also got the Chicken Teriyaki Bowl with rice and egg. This was neatly arranged and also carefully executed. 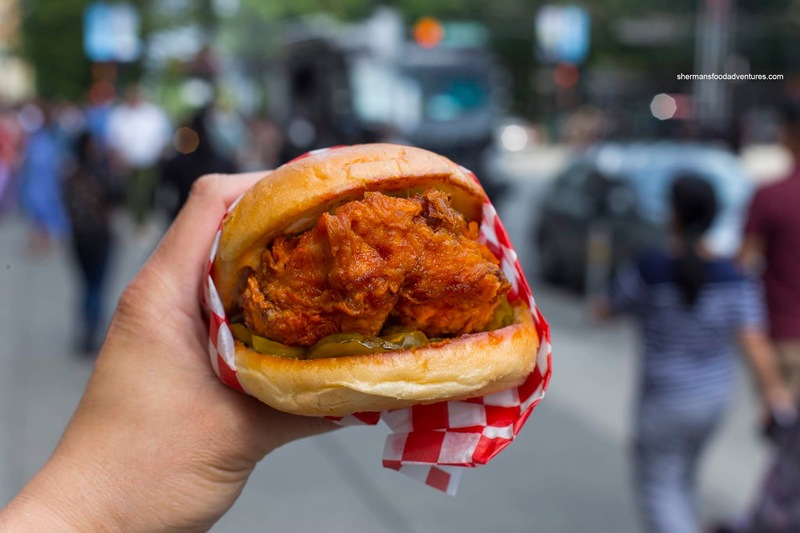 The fried chicken was pretty much the same as the one found in the sandwich. Therefore, it was thick, moist and crispy on the outside. However, without the benefit of the bun and sauce, the chicken ate rather plain. With that being said, the caramelized onions added a nice sweetness. Presented as a fairly large portion, the Bulgogi Fries were good. 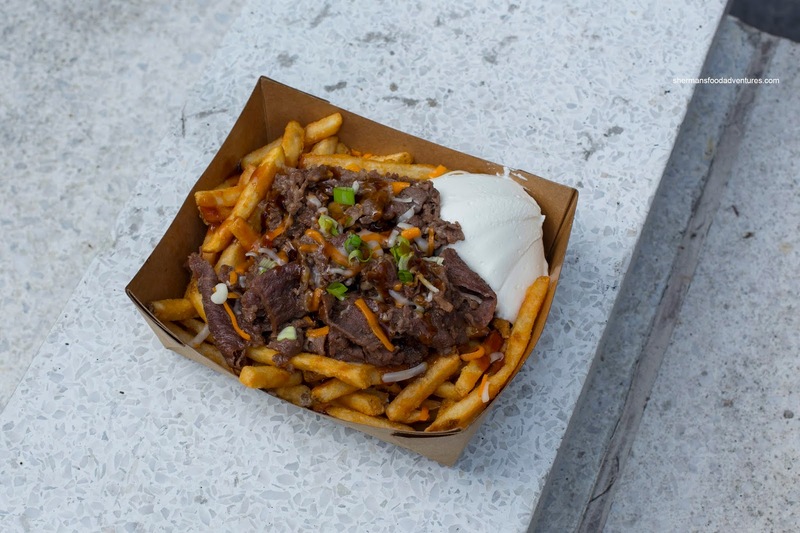 The starch-coated fries were golden brown and uniformly crispy. These were the perfect vessels for the ample amount of tender, well-seasoned beef on top. 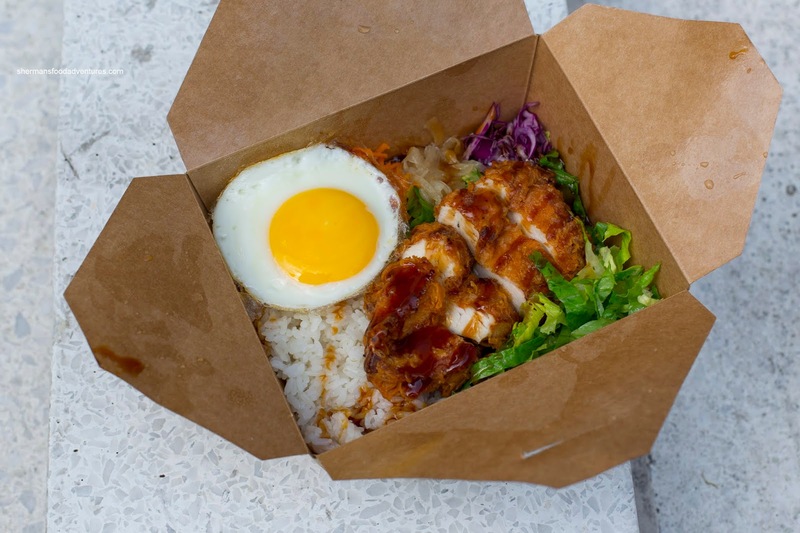 This was a meal in itself and in my mind, the second best thing to get from this food truck. In fact, all of the food was well-executed and I wouldn't hesitate to eat it all again.